Hello friends! There’s been plenty of watercolor ’round these parts…are you ready for some Copic blending tips? I’m trying to keep a good balance in my ratio of copic to watercolor…and hoping I can keep everyone happy! 🙂 Check out the video below or click HERE to see it in HD on YouTube, and come on back for some other notes too. 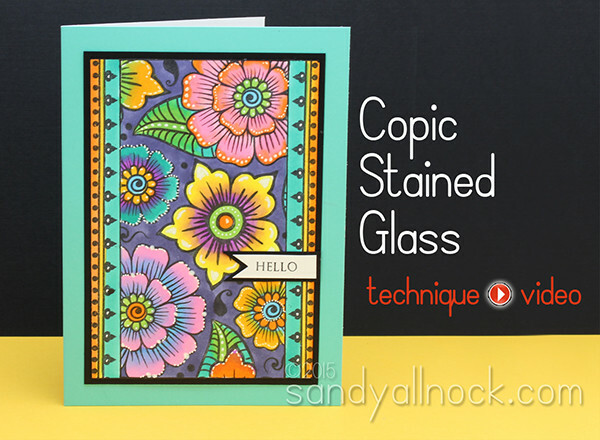 There are about a gajillion copic blending tips – this card shows mostly how to mix colors that aren’t naturally going to belong together. Practice the flick! Flicking in both directions will make it easier. Spend time in front of the tv just flicking on scratch paper til your hand gets the hang of it. When blending non-similar colors, be sure to use plenty of ink. That’s probably the most common thing that causes poor blending. It’s harder to blend a really dark color with a really light color. Keep them within a few numbers of each other in the LAST digit – that’s the one that indicates light/dark. Check out my YouTube channel for my Copic videos…if you go to THIS page and you’ll see thumbnails for all my videos – pick out what you want to see Copic-wise. Remember that Magical Monday videos have no voiceover. 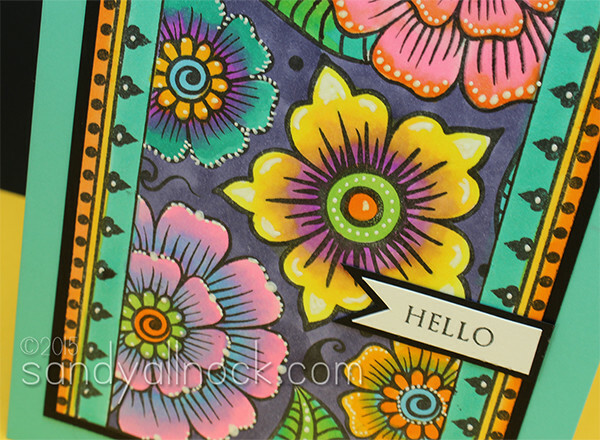 On this card I also used my W&P parallel ruler – helpful in making lines straight! The eraser I used to remove pencil lines is a kneaded eraser – super nice eraser on Neenah cardstock! If you’re looking for more copic blending tips, right now I’ve been launching a new EduDigi each Saturday – lots of great info in the digibundles! Sandy your card is amazing. I WISH I had Copics! Grrr! Anywho, I have always only had gelly rolls, some of them work well others not so much. (No matter the colour!) BUT, today we are talking white ones and I have not been having good luck with mine for a while. Probably because its old now. I live in Nova Scotia (Canada) and I am well above sea level, if that answers your question. Beautiful card Sandy! I live in central Illinois and have both the Gelly Roll and Signo pen. My Gelly Roll has always worked fine without any problems. I had one Signa pen that didn’t work very well. You would start and then it would stop for no reason. I ended up throwing it away. For Christmas I received another Signo pen, and this one works fine. I think I may have just had a bad one to begin with. Although the first one I had was in the summer, and this one I have only used in the winter…..I will find out this summer when it gets warm and humid. Gorgeous card. I love the purple and yellow together! In Wyoming at a little under 6000 feet, the Uniball and Pentel were hit and miss. Sakura Gelly Roll usually worked. Moved to Colorado around 6000 feet and tried all my pens last might. Uniball and Pentel would not work at all. Sakura Gelly Roll worked great. Could humidity also be a factor? Both Wyoming and where I am in Colorado are very dry. This was a great tutorial. The colors are beautiful. I LOVE my digital stamps because I can re-size them. However, I thought these were really pretty and clicked on the link you gave. For that many stamps I feel like the price was reasonable, but, the shipping cost was almost ½ of what the stamps cost. Do you know if they sell these at art and craft stores or are they sold only via the internet? I would like to try the Uni-ball pen that you used. I am also at sea-level on the east coast. I have a gelly roll pen but I don’t really like the thinness of the product. However, it is all I have to use. One day I’m going to get one of those rolling rulers. Love yours. I live in Puerto Rico, at sea level and my pen hardly ever work!!! The worst part is that I have opted not to use it, because it starts working and then it fails and I have to start all over again. I try wetting the tip, clicking it over and over on a scrap of paper to no avail. Any suggestions? Gorgeous card! I live in Philadelphia and I do have problems with the sign pen. Sometimes it works and sometimes it doesn’t. Despite that, it s still my favorite white pen. Love this technique and your card. I have tried just about every white pen out there, and love them the first time I use them, but they never work for more than a dot or two when I try to use them later. I have tried storing the both horizontal and vertical, nibs up and down, but nothing seems to help. Actually had one uninstall that wouldn’t work for me but a friend picked it up and it wrote perfectly for her. Think it must be me! I live in Central OK,. LOL! Maybe they have personalities! Beautiful card! I live in Sarasota FL just a couple miles from the Gulf. I never have trouble with my uniball signo pen. I have had jelli rolls clog up on me but if I hold a lighter to the tip for a couple seconds and then scribble, it gets them going again. I haven’t had to try that trick with the uniball though so not sure if that would work on it. So happy and cheerful! A definite mood brightener today in South Texas. Thanks Sandy! I could watch you color all day 🙂 This is beautiful! Love this so much! It is nice to see other colors blended, breaking free of the light, medium, and dark blends! Love the white pen work. I live in your neck of the woods and love my Signo. Such a cheerful card. Love the added details of the white Signo pen. I love mine and live in SW Michigan. Near Lake Michigan, if that makes a difference. Wow! You always make beautiful cards but this one is absolutely gorgeous! I love all the bright colors. I live in central Florida. Sometimes my pen works, other time not so much. I store them horizontal. I think it is the individual,pen. Still it is my favorite white gel pen. I’m in Houston, Texas and we are just below sea level. I have 3 Signo pens and have never gotten more than a few dots from any of them. Very frustrating! I use the Uniball Signo too, and I have no problems with it. We are about 250m over Sealeavel… But I think there are other reasons why some don’t have luck with theirs… Mayby the way you hold it!? I ll do it quite flat so the fluid keeps flowing well even with my fountain pen. My daughter holds it steep (I hope it’s the right word) she has sometimes Problems with her fountain Pen… I ‘ll give her a try with my uniball and let you know! Great card. The colors work so good together. I live in MA and a dingo does not work for me, however. I love my gelli roll.